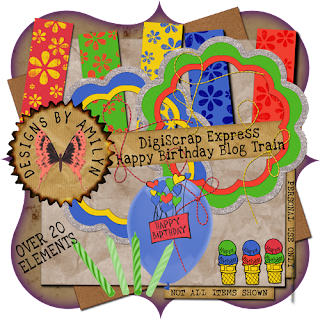 Thank you for your gorgeous part to this birthday blog train!! Love the colors! Thank you so much for this Freebie. I want to let you know that I posted a link to your blog in Creative Busy Hands Scrapbook Freebies Search List, under the Wedding, Birthday/Party Theme(s), Mardi Gras/Carnaval Theme post on Mar. 01, 2009. Thanks again. Awesome kit, thanks for your part! Amilyn, Thank you so much for sharing your talent and hard work! So much time involved, and so much inspiration that you are sharing. I just can't say how much going along this blog train has taught me about how generous people can be, including you, I picked up your other freebies that were still available and I feel like it's Christmas. I am subscribing to your log and I hope to hear how you are doing health-wise since your surgery! btw I love your daughters' names! Love your kit, thank you!! Great kit! Such wonderful pieces! Thank you!!! Thank you so much for this Freebie. I want to let you know that I posted a link to your blog in Creative Busy Hands Scrapbook Freebies Search List, under the Wedding, Birthday/Party Theme(s), Mardi Gras/Carnaval Theme post on Apr. 07, 2009. Thanks again. "If the military had wanted you to have a spouse, they would have issued you one." Remember those words? Well, that was then and this is now. The military has realized and acknowledged the significance of the military spouse. In 1984 President Reagan proclaimed the Friday before Mother's Day of each year to be Military Spouse Appreciation Day. It is your day to stand up and be honored. For the times you've stood and watched a ship sail from the harbor, an aircraft disappear into the clouds, or a truck convoy pull out of sight, not sure when they would return, we thank you. For the countless household moves you've made from a place you know to one that's strange and different - often by yourself - we thank you. For the families you've held together, for the anniversaries, birthdays, and holidays you've celebrated alone, we thank you. For the hand you've extended to another military spouse when the need was there, truly creating a military family, we thank you. For the spirit and strength you've shown when your service member has gone into harm's way, we thank you. For the pride you've displayed while serving as an ambassador of the military spouse to the rest of the world, we thank you. Far too frequently, the sacrifices and dedication of the military spouse have gone unnoticed and unappreciated. In our nation's recent history, thousands of service members have been placed in harm's way as they stood watch as freedom's guardian. You too have stood watch at home, facing challenges alone. You have waved flags and held banners high to express your support. You have kept the candles burning on the home front as a reminder of our deployed military. You have made difficult sacrifices of your own, and have called upon your inner reserves to nurture family life so your service member can focus on the business at hand. Even in times of relaxed alert status for our military, you have stood ready and alert for the slightest of signs, perhaps overlooked or ignored by your civilian counterparts, signaling a potential change in the status of our military forces. As a military spouse, you have willingly packed up and relocated countless times, and may have been separated from your own parents and siblings for several years at a time. Quite often, you have been placed in an unfamiliar ethnic or cultural setting, or a remote location. You have met this challenge with confidence and pride, making your nation proud of you. By the same token, you have extended your hand and hospitality to visitors to our country. A country cannot count itself strong by its armed services alone, but must also depend on its civilians. With military wives and husbands setting a superior example through devotion, courage, and commitment, we are a nation of strength. Military spouses .. stand tall, stand proud ... we salute you, you are truly our unsung heroes. Beautiful kit, thanks for the freebie.